This is the third in a weekly series of blog posts that will feature medical students telling their story of how they got into medical school. Earlier this week, we heard from Abby about how she got into the Johns Hopkins School of Medicine. Today, David Gamble shares with us the amazing story of how he got accepted to the University of Colorado School of Medicine, the same campus where he had a benign tumor removed at the age of 17. David, tell us a little bit about you and your background. I am from a small mountain town in Colorado called Estes Park, and I went to Baylor University in Waco, TX . There, I was pretty involved on campus, especially in my last couple of years. Some of my main activities included research in an organic chemistry lab and volunteering at hospitals and small clinics that catered to underserved patients. I helped inaugurate the Christian Pre-Health Fellowship, a group created to connect students who wanted to tie their professional goals with their faith. I was also a teaching assistant for a pre-medical class, and after graduating, I went to the Netherlands to be a teaching assistant for a pre-med study abroad program based in Maastricht. Upon my return to the states, I worked as a nursing assistant for 6 months before starting medical school. When I’m in Colorado, I love skiing, spending time with friends, hiking, and although I dabble in climbing, I’m not very good at it. What initially attracted you to pursue medicine? My first main exposure to the medical field happened when I was 17. I had a benign tumor in my spinal cord that I had to have removed. My first main exposure to the medical field happened when I was 17. I had a benign tumor in my spinal cord that I had to have removed. It was a 4 hour surgery, actually conducted on the same campus I’m currently attending medical school (University of Colorado School of Medicine). I was put under anesthesia and after the surgery was done, it took a week for me to be able to walk again. This experience opened my eyes to the impact doctors can have on lives and started my pre-medical journey. After that, I gained first-hand experience through shadowing, taking pre-med classes, and conducting research. My professors and mentors inspired me to pursue science as a field of study, but also encouraged me to pursue a career that would allow me to impact lives in a meaningful way. I figured that medicine was the best way to both use my skills in science and critical thinking and also have a meaningful impact on the health and lives of others. 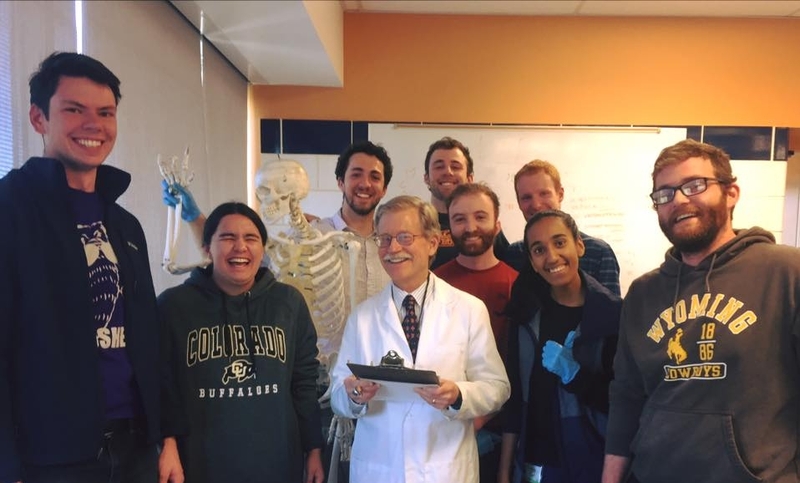 Why did you choose to apply to the University of Colorado School of Medicine? CU Denver is actually the only allopathic school in the state of Colorado, so that made my choice pretty easy as a Colorado resident. I really wanted to be close to family again and CU Denver is a school that has a big emphasis on primary care, which is what I think I want to do. I also appreciated the way that they put trust in students. Lastly, the way they teach their curriculum was pretty attractive to me. Give us 3 reasons why you think you got into the University of Colorado. Was there anything about your story that you think made you stand out? I worked in an underserved rural area for an internship which I think helped my application specifically because CU Denver has quite an emphasis on rural medicine. I still feel like they made a mistake! I am a re-applicant, and although I did have a pretty good academic record, I think the extracurriculars I pursued in my senior year—especially in research, leadership and service—helped me develop interview skills that helped me perform well on the interview (a factor people don’t prioritize enough). To the second question, I think the variety of the experiences that I had helped my application. For example, I helped start an internship and an organization (Christian Pre-Health Fellowship) at Baylor. Also, I worked in an underserved rural area for an internship which I think helped my application specifically because CU Denver has quite an emphasis on rural medicine. It felt pretty ambiguous as to whether I did well after one of my interviews. The interviews were pretty structured, which was good for objectivity, but I wasn’t sure whether my answers fit the mold of what they were looking for. Another one of my interviews felt great and I got good feedback on it, but overall after my interview date it felt pretty uncertain what the outcome might be. Take us through the moment you got accepted. I picked [the phone] up and when it was answered by the Dean of Admissions at CU, I pretty much blacked out and couldn’t remember anything after that. I was at my parent’s house in Colorado and I was trying to learn Spanish with Duolingo because I’ve always wanted to. I got a call from a number that looked like it was from Denver and I thought it was a telemarketer like usual. I picked it up and when it was answered by the Dean of Admissions at CU, I pretty much blacked out and couldn’t remember anything after that. It was the most relief I’ve ever felt and the most elation I’ve ever experienced. I called my mom and she came home and called all our relatives. Needless to say, it was a big ordeal. I would say the best advice that I heard and that I can give is to not try to fit a pre-med mold or fit in and compare yourself with all your peers. Instead, do what really interests you and make sure you’re taking care of yourself and developing good character. If you do those things, you should look attractive to med schools because they will see you are passionate about your experiences and about the medical field in general. What do you mean by character? I would say a person has character if he or she has integrity, puts others before themselves, and is willing to do what’s right even when people aren’t looking over your shoulder. Basically someone who is conscientious and cares about other people. Why do you think that is attractive to med schools? At least at CU, there’s a huge emphasis on student integrity. For example, we write our own honor code and the school is very student directed. For that reason, having a good sense of character and integrity will both help you be a good doctor and help you be successful in medical school, especially when you start seeing patients during your rotations. David Gamble grew up in the small town of Estes Park, Colorado and received a B.S. in Health Science Studies from Baylor University. He took a year off before starting medical school, during which he worked in rural Kansas, the Netherlands, and Colorado. David is currently a first year medical student at the University of Colorado School of Medicine. He enjoys exploring the mountains by foot and on a snowboard, along with spending time with family and friends.